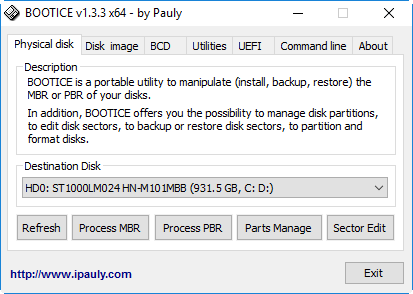 Download All Pauly's Bootice software versions .Bootice utility can repair MBR and PBR of Hard disks and USB flash drives . What is Pauly's bootice tool ? Pauly's bootice tool is a portable boot-related utility. 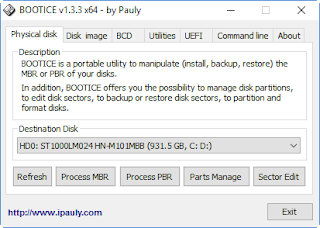 Bootice utility enables you to backup , modify and restore MBR "Master Boot Record " and "PBR "Partition Boot Record of hard disks and usb flash drives . BOOTICE can help you to re-partition and format a USB flash drive if it has been previously formatted with a non-Windows file system, which usually results in Windows not being able to see all or only a portion of the USB flash disk . Repair and Restore MBR "Master Boot Record " of Hard Disks and USB flash drives . Backup and restore PBR " Partition Boot Record " . USB flash disk Re-partition and formatting . Edit Grub4DOS boot menu . Edit BCD file of Windows NT 6.x . Erase all the data on your disk or logical drive . BOOTICE supports boot records from Grub4Dos, SysLinux, Plop, Windows NT5/6 and others. Other features include support for disk images, disk filling with random data, BCD editing, partition management, command line options, and more.